For most new moms the thought of leaving their new bundle and heading back to work may bring on some anxieties. First, the transition back into the working world may no longer be where your heart is at. If you feel a little lost and overwhelmed as to how you will juggle work matters along with making milk at work, keep reading. You will get tips on how to successfully pump at work, the rights you have to do so and so much more! Before we get to the 6 tips, I must introduce to you the perfect resource for your back to work pumping success! I’m talking about a video course called, The Ulitimate Back to Work Pumping Class. This online class covers everything you need to know about transitioning back to work while breastfeeding, maintaining your milk supply, safe milk storage and more. Wouldn’t it make you feel less stressed to learn how to best pump at work and keep your milk supply so you can continue to provide your baby with breast milk for as long as you’d like? 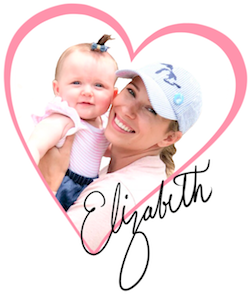 Grab a seat for only $19 and get my exclusive pumping and milk supply course for free – here are the details! Let’s take a look at some helpful back to work pumping tips that will help you pump like a boss and make more milk while at work too! Before you head back to work with pump in tow and your “pumping in progress” door sign, it may be a good idea to notify your boss of the extra curricular assignment you have been given by your beautiful new baby. Because let’s just call it what it is, that sweet little baby is really the new boss around – am I right? Preparing your boss ahead of time will help them appreciate you more and give them the ability to adapt what they need to in order to accommodate the breaks at which you are allowed to express. 2. Bring a Fast Breast Pump and a Spare! Even though there may be days you are grateful for the little “getaways” you are by law aloud to have, making the task run as efficiently as possible should be the goal. I recommend a pump like the Medela Pisa for something quick, efficient and powerful. However, the Medela is loud and somewhat large. Another little tip is to leave an extra pump at the office for one less thing to think about on those busy and early mornings. For a portable, compact and quiet pump, yet still powerful, the BabyBuddha breast pump is the way to go. I have an exclusive discount code you can use for the BabyBuddha, go here to get it! Another great resource I should mention before we go any further, is how to get a free breast pump through insurance. The process is super easy and it could save you thousands – literally! I had a brand new hospital grade breast pump sent to my door and all of the breast milk storage bags I could house (mentioned in the next tip) all for free! Here’s where you go to get yours too: Take me to get my free breast pump please! You do not want to be stuck at work without your pumping supplies, that could lead to so many problems! Engourgment and clogged milk ducts are a real concern when going too long in-between pumps. Not to mention, the hit your milk supply can start to take if pumping sessions are missed. So, take extra care to keep your pump bag prepared and ready to go daily. Some items you will want to pack for pumping at work are as follows. Check the links above for specific product recommendations and current pricing. How horrific would it be to find that someone in the office has mistaken your liquid gold for coffee creamer!? Yes, I have heard of this happing. To avoid a traumatic scenario like this from happening, you will want to make sure you have a safe space for your breast milk to reside while you are at work. This could be in your Kiinde bags, with lid tightly secure and labeled in a designated fridge or freezer. If that is not provided, you may need to bring a cooler and store your breast milk in that. Some working moms like to bring a small lunch bag with a good ice pack to keep their breast milk in by their desk, just to keep an extra close eye on. Find out how long expressed breast milk can sit out for. If you’re tight on a time crunch and don’t want to spend extra time washing parts after every pumping session, you can place them into a large zip-lock freezer bag and store in the fridge until the next pumping session. By law, your employer must provide a lactating mother with a suitable space to express her breast milk in. This space must be shielded from view of other employees and protected from public intrusion. Doing your best to set up this space and get it as comfortable as possible for your time to pump at work will make the transition from work to pumping much smoother. Have your spot in the space ready to go with a seat and your supplies in place, if you can. 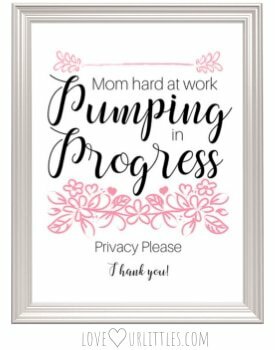 A “pumping in progress” door sign, (like the free one I placed below) is a great idea to detour employees from barging in while you are in your vulnerable state. Download, print and display at work while you are pumping! Mom brain is a real thing – and not a laughing matter. Here are some tips to help you remember your breast milk and supplies at the end of a long work day. Set a reminder on your phone. Put your purse, keys or phone in the room your breast milk is being stored in. Ask a co-worker to remind you. Place a sticky note on your computer. Whatever it is you need to do in order to not forget your most valuable hard work of the day – do it! We just went over 6 of the basic pumping at work tips. Now, lets get serious and go over how you can pump at work like a real boss and get more milk while you work! How does pumping at your desk, while working (and making money) sound? I’d say that’s profitable pumping right there! Who’s the cash cow now? Ok – I’ll stop. But seriously, there is a way you can pump at your desk, not hidden away in a room like some prisoner in solitary confinement for half of the day. Use the links above to check current pricing. Using this system will allow you to place your Freemie Collection Cups into your sports bra, completely hidden from view and pump without anyone even knowing you are doing so! If you do decide to go with the BabyBuddha for this system, it is a powerful and quiet pump that will get the job done beautifully. Most pumps can be easily hacked with the Freemie Cups using the Mayhem adapters. Here is a video showing the process. Not only will you be able to pump at work more often, but you may find that your milk supply increases because of this. Being busy while pumping almost always equals to pumping for longer periods of time too and that usually leads to a higher supply and demand output. Best Breast Pumping Hacks and Tips too Good Not to Share! I have all the confidence in the world that after you put these tips and tricks into your back to work pumping arsenal you will be a pumping like a boss your first day back! One more quick look at those back to work pumping tips. Prepare your boss ahead of time – so they can work with you. Bring an efficient breast pump – to get the job done quickly. Pack your pump bag and prepare it ahead of time. Secure safe storage for your breast milk – don’t let it become someone’s coffee creamer! Set up your lactation station. Set reminders so you don’t forget to bring home your liquid gold for baby! One last reminder to head over to Milkology and get yourself enrolled in The Ultimate Back to Work Pumping Class for only $19.00! P.S. If you enroll in any course through one of my links, I will send you my pumping and milk supply course for free, here are the details.